I always sweat my eggplant but I never thought to peel it. I will have to give that a try next time I make it. I love the sound of your red pepper sauce. Peeling makes a HUGE difference. Give it a try! I love eggplant parmesan. Your sauce sounds incredible as I really like red peppers as well. Your eggplant looks so crispy and inviting! Just want to dive in! Thanks for joining us this week. Thank you! It is tempting to eat the whole batch before assembling the dish! What a great sounds tomato sauce. I love anything roasted red pepper. I’ve never peeled my eggplant. Must give it a try! There is nothing better than a good Eggplant Parmesan… I love your tips and can’t wait to try your recipe! I agree with you about the two secrets, if you don’t peel them they are bitter. These look so crisp and yummy!! Thank you! My hubby is from Long Island and is very picky about his Eggplant Parm! Eggplant parm is one of my favorite dishes! Thanks for sharing the cooking tips…those are the best 2 tips when preparing eggplant! I do love a crispy crust! Great tips on frying eggplant. I’ve never really been a fan because of the texture. Maybe it was because it was too wet. I’ll have to give yours a try and it might just convert me to loving eggplant. I simply love eggplants, and can eat them in any form there is. Breaded and with tomato sauce and cheese is incredibly delicious! This looks great! I have never made anything with eggplant. I will have to try it. Eggplant is a household fave! Give it a try. You’re going to think I’m absolutely crazy but I don’t like eggplant (I’m looking sheepish as I type this). I do love all things battered and fried though so I could probably make this, using all your super helpful tips, with zucchini (which I love). The fried batter on your eggplant looks perfect! Eggplant Parmesan is one of my favorite dishes! I love that you added roasted red peppers to your sauce. Perfect! Chicken Parm is one of my favorites, this looks great with the eggplant! Thanks for the eggplant tips! 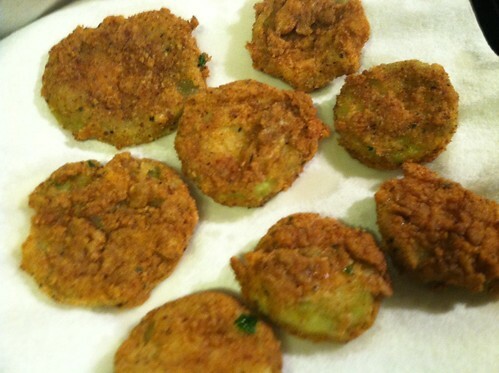 Oh, these are such beautiful fried eggplant–they look perfect. Eggplant Parmesan is one of my favorite dishes. I’m going to try your recipe! This is the first time I came across with crispy eggplant….I must try this out and thank you for the useful preparation tips! Great idea peeling the eggplant first! I love fried eggplant, but they always soak up so much oil, I try not to have them too often. This recipe looks pretty awesome. Thanks! It comes out perfect evety time!